All of the Amusement Parks I've been to. California Great America - Before this year, I've only been to Great America once when TiVo went there for a company picnic. The only rides I remember from that trip were the Sky Ride and the bumper cars. That was one visit in 18 years. When I was larger, there were many rides I could not get on. None of my friends would invite me to go to Great America. It my 19th year here we bought season passes to Great America. Yes, it is because we need activities to do with a three year old. We have taken more than ten trips there this year. Most of the time we have gone to Snoopy Landing. I must of ridden Lucy's Crabby Cabs 20 times this summer. I got Aiden to ride all the rides in Snoopy Landing. This was one of my goals. I work close enough to Great America to take a long lunch there. I have taken a couple of week day trips to ride the Flight Deck and the Patriot. I hope to ride the Railblazer by the end of the summer. The last time I was there it was a 90 minute wait. I have the feeling there will be future Great America season passes in my future. Dorney Park - I have a long history of going to Dorney Park. We used to go there a couple times a year. It was the park we went to for the local youth sports leagues picnics and company picnics. I have been there more times than I could count before 1990. I have a whole bunch of stories about it. When I was really young my Dad wondered why I had two black eyes. There was a ride call the Glass House, it was a moving mirror and glass maze. My sister and brother thought it was funny to get me to run into glass wall as fast as I can. There was one time my dad made my sister Alice watch me at the park. I must have been in second or third grade at the time. The only ride I wanted to go on at the time was the bumper cars. Alice forced me to ride the Roller Coaster Thunderhawk. I was just tall enough to ride. I road the whole ride on the bottom of the car. I lost my little league baseball cap. My dad make Alice buy me a new hat. She bought me a Thunderhawk hat and I wore that hat for two years. I had a lot of different favorite rides over the years, including The Bumper Cars, the Iceberg, the Gold Mine, The Indy 500, and the Journey to the Center of the Earth. I really have no idea how many times I went to Dorney Park in the early 80s. Disney World Magic Kingdom - The summer I was 16 years old Dad had a work conference at Disney World. When I was younger most of my friends went to Disney World, some of them went every other year. I got the message it was not going to happen in my family. When I finally got to go we did stay at the Disney's Contemporary Hotel, which is still a very cool building. I want to stay there again someday. The night we got there Sean and I rode the monorail all around to all the hotels. We must have been saving our park tickets for full days. It was fun to go to Disney World at 16 years old with two of my older siblings. I remember going through the Space Mountain, The Haunted Mansion, The Monorail The Jungle Cruise, The Pirates of the Caribbean, It's A Small World, Dumbo, the Hall of Presidents, Country Bear Jamboree, and Dumbo. I must of have rode more than that, but I don't remember. Disney World Epcot - On the same trip to Disney World, We went to Epcot Center. At the time, 1988, Epcot was not know as much of a theme park. It was more of the feeling of a odd World's Fair. I remember going to Spaceship Earth, Captain Eo, and having lunch in the United Kingdom Pavilion. I know we must of done more, but nothing comes to mind. I think going there now would be really fun. Disneyland - I have been to Disneyland three times in the past two years. I only went to Disneyland for the first time in 2017. I regret not going there sooner. I thought being the single guy in Disneyland alone with a camera would be creepy. Now I know no one would have notices or cared. I missed a lot of good photo opportunities by not going sooner. I really enjoy Disneyland. It is fun vacation to take a family. I never had to worry about Scooter being board. It is easy to always have kid things to do. Sometimes other vacations don't always have this. 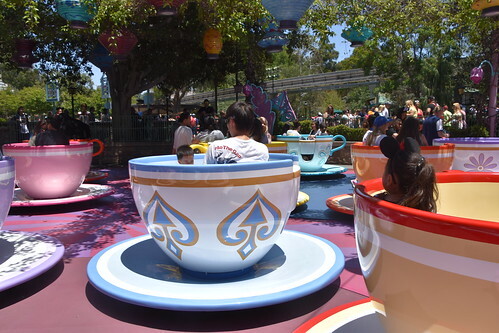 I still have a number of adult rides to try at Disneyland. I have the feeling will be taking a lot more visits to Disneyland over the next couple of years. My goal is to ride a new ride every trip. Disney California Adventure - Yes every time we go to Disneyland we also go to Disney California Adventure. I like this park and I am happy I have seen it now. It seems like Disney is still trying to rework this land. I like the idea of Disney celebrating California. I really liked Bugs Land and Paradise Pier. Most of the time I've spend there has been in Cars Land. I got the chance to walk around the park and hour before it opened. If you get that chance you need to take that walk. Gilroy Gardens - The summer after our first trip to Disneyland we took a trip to Gilroy Gardens. 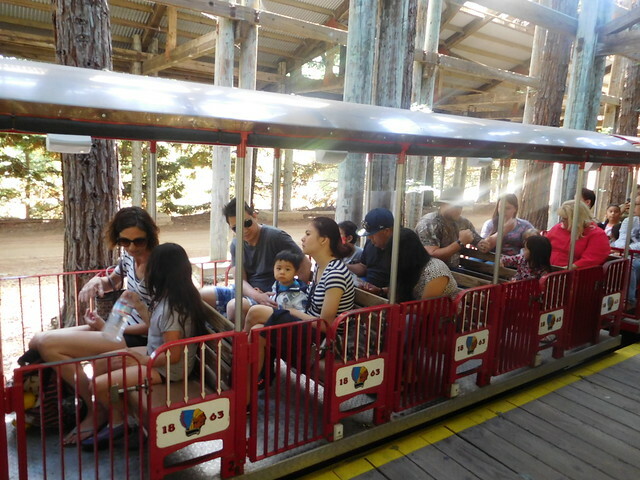 We got to ride the train, look at time trees, walking through a garden, and riding a couple of rides. It is a good park for kids. It reminds me of old independent amusement parks you don't see anymore. We need to take more trips there. I think Scooter would get even more out of it this year. Our season pass to Great America also gets us admission there, but we usually just go to Great America. We should get a trip there this year. Busch Gardens Williamsburg - My family visited Busch Gardens two years and a row. I think it was 1980 and 1981. I know it was too short to ride most of the rides at that time. I don't remember them having a kids land at the time. I remember afraid of the Lock Ness Monster. 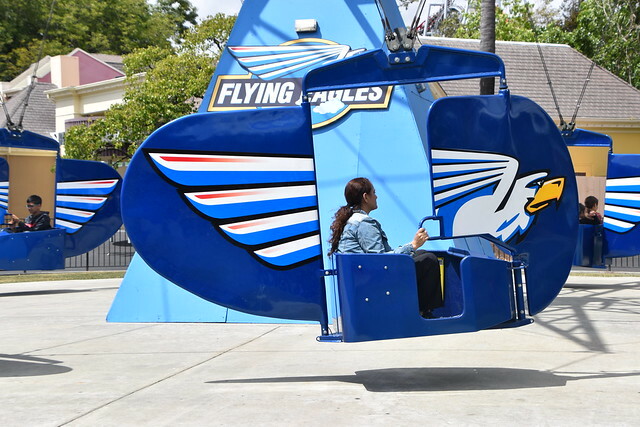 The only ride I remember taking was the skyride. I remember really liking the live shows more at Busch Gardens than the shows at Great Adventure at the time. Six Flags Great Adventure - More than 10 visits, but I could not give an accurate count. My last visit was in 1990 or 1991. I am not sure how old I was when I first went to Great Adventure, but it was before it was under the Six Flags banner. I've seen a photo of myself on the Log Flume where it said Bally's Great Adventure. Back then the drive through safari seemed like a big deal at the time. You could say this was one of the two local amusement parks to me growing up. When I was a little kid I hated Roller Coasters and loved the log flume. When Roaring Rapids opened, that become my favorite ride. When the Sarajevo Bobsled opened it was my first adult roller coaster I liked. I remember that when Dad was looking after me, we often went to see the diving show. When in was in high school I figured out how to enjoy steel roller coasters like the Great American Scream Machine. I have a strong memory of riding the Roter on High School Physics Day with Bill, Nicky, and Trevor. Maurya convinced me to ride the Enterprise with her, which is a ride I hated, and got me sick for the rest of the day. There was one time where Gerry and I rode the Shockwave 10 times in a row in the last hour before the park closed, after seeing the Smithereens play an amazing concert to 60 people. Great Adventure is the park I have been to the most times with friends. Most amusement park trips in my life have been with family. Sesame Place - I think I've been to Sesame Place 4 to 6 times. I went there the year it opened in 1980. Most of the times I went it was a camp trip from the Warminster Parks and Rec department. I don't remember my dad every taking me there. I don't think I ever went to Sesame Place after elementary school. None of the rides there now were there when I last went there. That is unusual for most amusement parks, but Sesame Place was an unusual park back then. Sesame Place didn't have rides like it has now. It was all "Kid-Powered" attractions. Jim Henson built this place with a hippy ethic that made the place different. The Nets and Climbs was my favorite. I wish that was still around now, I think Aiden would love it. The Computer Gallery was filled of educational programs, a disappointment to an Arcade fan like me. 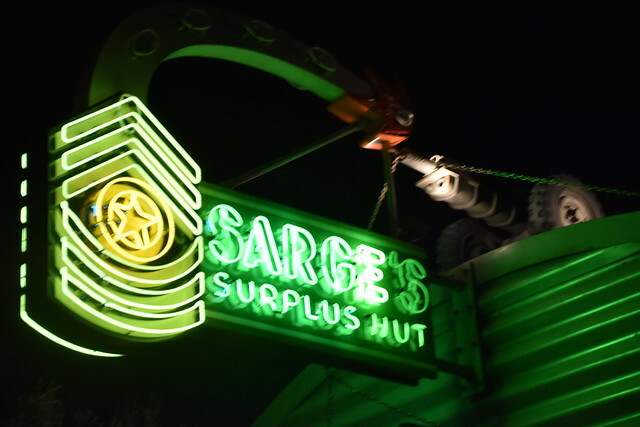 This was the first place I ever saw a ball pit, a huge bounce house, and a couple of zip line things. There were many elements of things that you see in small play area now. It just didn't amount to a modern amusement park. I went to Billy Beez this weekend and it reminded me of my old Sesame Place. Kings Dominion - I've been to Kings Dominion twice in the 80s, but I really don't remember it that well. I went once when my sister tried to get a job there and another time with my sisters. 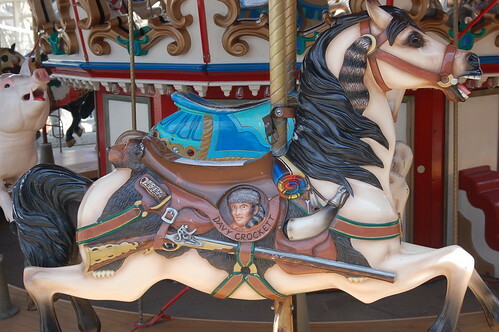 I only rides I remember riding are the Rebel Yell, the Skyride, and the Eiffel Tower. I remember it being a nice park, but not overwhelming. Happy Hollow Park and Zoo - For a while I was not sure if Happy Hollow would make this list or not. Is it an amusement park or is it a zoo. I guess it is a little of both. On this list, I must have gone to Happy Hollow the most times. We've had season passes to Happy Hollow three different years. Aiden has rode all the rides at Happy Hollow. I've rode all the rides that I fit also. There are only about 10 rides total. A co-worker told me he used to go to Happy Hollow all the time until his kids turned 8. I think that might be right. 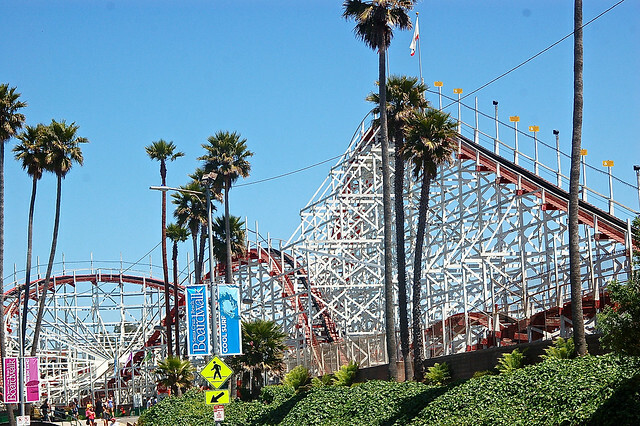 Santa Cruz Beach Boardwalk - I've been to the Santa Cruz Beach Boardwalk six or so times, but I've only rode rides once. The first five times I west there it was just for photos shoots. It was one of the first places I went when I moved to California. I finally got to ride a ride there this year, my company summer picnic was there. Aiden loved both the rides there and the beach. I have the feeling there are many more trips to Santa Cruz in my future. Belmont Park - I've been to Belmont park a few times to take pictures, just like Santa Cruz. I will make sure to ride something the next time I go there. West Point Park - There used to be a small local amusement park in Montgomery County, close to where I grew up. We would go to West Point Park for Fathers Day and my dad's company picnic. It is the kind of small amusement park that just does not exist anymore. It had an all dirt parking lot and two softball fields there. I remember the picnic grove was right next to the entrance. When we went to the company picnic there the only free beverage for kids was birch beer. They had a pretty good kiddie ride area at West Point park. It was totally encircled by big roller coaster. 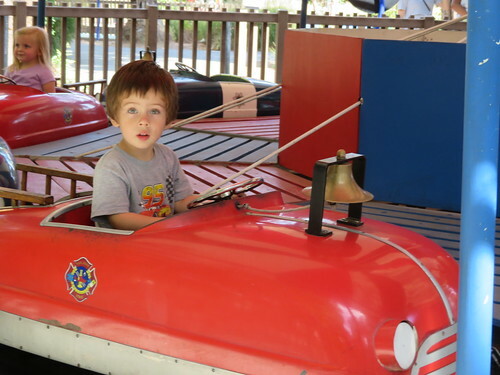 I used to like the train and the bumper cars, and non of the other rides there. I remember going on the whip and the Tilt-A-Whirl and getting sick trying to walk off the ride. I remember about once an hour someone losing all their change when riding the Salt and Pepper shakers. The arcade there had Skee Ball, Pinball, and old Electro-mechanical arcade games. These were machines from the 60s and 70s. They seemed far older then the world of Pong and Space Invaders. I'd burn through my quarters quickly and spend what seemed like hours watching other people play.